This is part I of two posts on the most recent data concerning the earliest known Indo-European migrations. Most of these personal names belong to a name-giving tradition different from that of Ebla; Arra-ti/tulu(m) is attested also at Dulu, a neighbouring city-state (Bonechi 1990b: 22–25).28 We must, therefore, deduce that Armi belonged to a marginal, partially Semitized linguistic area different from the ethno-linguistic region dominated by Ebla. Typical are masculine personal names ending in -a-du: A-la/li-wa-du/da, A-li/lu-wa-du, Ba-mi-a-du, La-wadu, Mi-mi-a-du, Mu-lu-wa-du. This reminds one of the suffix -(a)nda, -(a)ndu, very productive in the Anatolian branch of Indo-European (Laroche 1966: 329). Elements such as ali-, alali-, lawadu-, memi-, mula/i- are attested in Anatolian personal names of the Old Assyrian period (Laroche 1966: 26–27, 106, 118, 120). 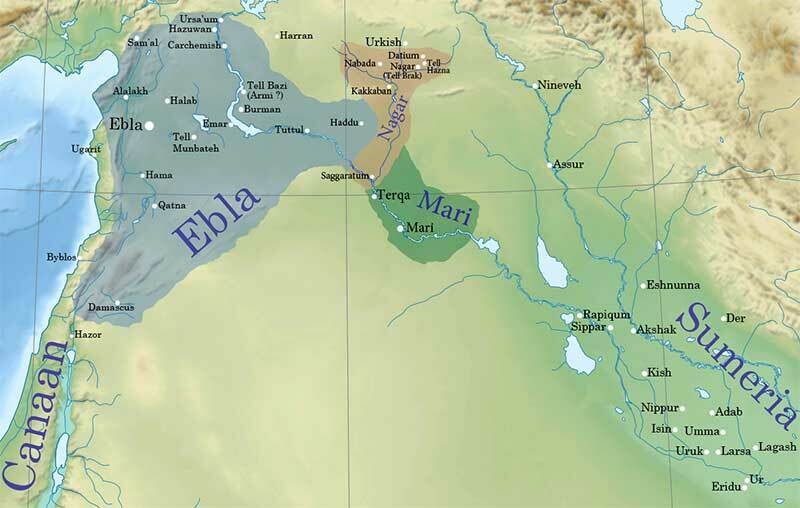 Ebla’ first kingdom at its height c. 2340 BC. Hipothetical location of Armi depicted. The first Eblaite kingdom extended from Urshu in the north,1 to Damascus area in the south.2 And from Phoenicia and the coastal mountains in the west,3 4 to Tuttul,5 and Haddu in the east.6 The eastern kingdom of Nagar controlled most of the Khabur basin from the river junction with the Euphrates to the northwestern part at Nabada.7 Page 101. From Wikipedia. Taken as a whole, the available information suggests that Armi was a regional state, which enjoyed a privileged relationship with Ebla: the exchange of goods between the two cities was comparable only to that between Ebla and Mari. No other state sent so many people to Ebla, especially merchants, lú-kar. It is only a hypothesis that Armi was the go-between for Ebla and for the areas where silver and copper were extracted. This proposal is similar to the one used to support Indo-Aryan terminology in Mittanni (ca. 16th-14th c. BC), so the scarce material should not pose a problem to those previously arguing about the ‘oldest’ nature of Indo-Aryan. NOTE. On the other hand, the theory connecting ‘mariannu‘, a term dated to 1761 BC (referenced also in the linguistic supplement), and put in relation with PIIr. *arya–, seems too hypothetical for the moment, although there is a clear expansion of Aryan-related terms in the Middle East that could support one or more relevant eastern migration waves of Indo-Aryans from Asia. 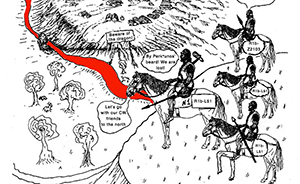 Once we have accepted that Anatolian is not Late PIE – and that only needed a study of Anatolian archaisms, not the terminology from Armi – , we can move on to explore the potential routes of expansion. A current sketch of the dots connecting Khvalynsk with Anatolia is as follows. 1—39 — sceptre bearers of the type Giurgiuleşti and Suvorovo; 40—60 — Gumelniţa-Varna-Bolgrad-Aldeni cultural sphere; 61 — Fălciu; 62 — Cainari; 63 — Giurgiuleşti; 64 — Suvorovo; 65 — Casimcea; 66 — Kjulevča; 67 — Reka Devnja; 68 — Drama; 69 — Gonova Mogila; 70 — Reževo. 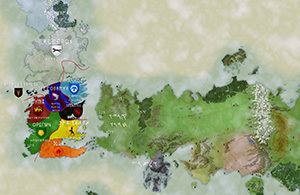 First, we have the early expansion of Suvorovo chieftains spreading from ca. 4400-4000 BC in the lower Danube region, related to Novodanilovka chiefs of the North Pontic region, and both in turn related to Khvalynsk horse riders (read a a recent detailed post on this question). Then we have Cernavoda I (ca. 3850-3550 BC), a culture potentially derived from the earlier expansion of Suvorovo chiefs, as shown in cultural similarities with preceding cultures and Yamna, and also in the contacts with the North Pontic steppe cultures (read a a recent detailed post on this question). We also have proof of genetic inflow from the steppe into populations of cultures near those suggested to be heirs of those dominated by Suvorovo chiefs, from the 5th millennium BC (in Varna I ca. 4630 BC, and Smyadovo ca. 4500 BC, see image below). If these neighbouring Balkan peoples of ca. 4500 BC are taken as proxies for Proto-Anatolians, then it becomes quite clear why Old Hittite samples dated 3,000 years after this migration event of elite chiefs could show no or almost no ancestry from Europe (for this question, read my revision of Lazaridis’ preprint). NOTE. A full account of the crisis in the lower Danube, as well as the Suvorovo-Novodanilovka intrusion, is available in Anthony (2007). Modified image, including PCA and supervised ADMIXTURE data from Mathieson et al. (2018). Blue arrow represents incoming ancestry from Suvorovo chiefs, red line represents distance from the majority of the neighbouring Balkan population in this period studied to date. 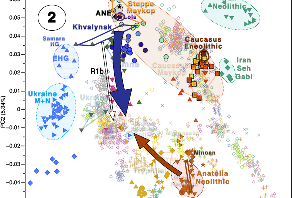 Northwestern-Anatolian Neolithic (grey), Yamnaya from Samara (yellow), EHG (pink) and WHG (green). 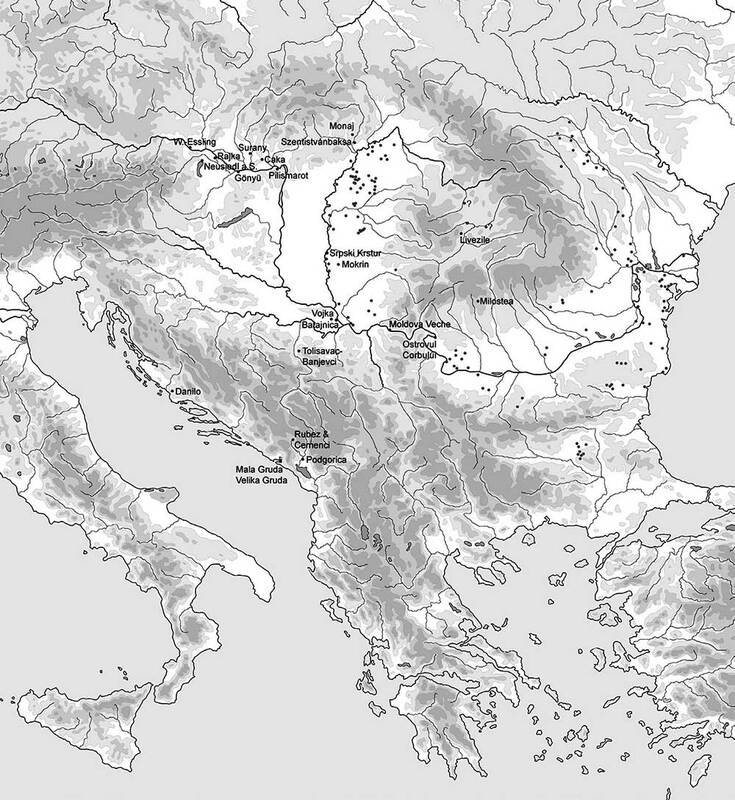 The later connection of Cernavoda II-III and related cultures (and potentially Ezero) with Troy, on the other hand, is still blurry. But, even if a massive migration of Common Anatolian is found to happen from the Balkans into Anatolia in the late 4th / beginning of the 3rd millennium, the people responsible for this expansion could show a minimal trace of European ancestry. Earlier third millennium cal BCE is the period of development of interconnected Early Bronze Age societies in Eurasia, which economic and social structures expressed variants of pre-state political structures, named in the specialized literature tribes and chiefdoms. In this work new arguments will be added to the chiefdom model of third millennium cal BC societies of Yunatsite culture in the Central Balkans from the perspectives of the interrelations between Dubene (south central Bulgaria) and Troy (northwest Turkey) wealth expression. Possible explanations of the similarity in the wealth expression between Troy and Yunatsite chiefdoms is the direct interaction between the political elite. However, the golden and silver objects in the third millennium cal BCE in the Eastern Mediterranean are most of all an expression of economic wealth. This is the biggest difference between the early state and chiefdoms in the third millennium cal BCE in Eurasia and Africa. The literacy and the wealth expression in the early states was politically centralized, while the absence of literacy and wider distribution of the wealth expression in the chiefdoms of the eastern Mediterranean are indicators, that wider distribution of wealth and the existed stable subsistence layers prevented the formation of states and the need to regulate the political systems through literacy. The only way to link Common Anatolians to their Proto-Anatolian (linguistic) ancestors would therefore be to study preceding cultures and their expansions, until a proper connecting route is found, as I said recently. These late commercial contacts in the south-eastern Balkans (Nikolova also offers a simplified presentation of data, in English) are yet another proof of how Common Anatolian languages may have further expanded into Anatolia. NOTE. One should also take into account the distribution of modern R1b-M269* and L23* subclades (i.e. those not belonging to the most common subclades expanding with Yamna), which seem to peak around the Balkans. 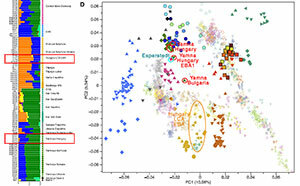 While those may just belong to founder effects of populations preceding Suvorovo or related to Yamna migrants, the Balkans is a region known to have retained Y-DNA haplogroup diversity, in contrast with other European regions. Phonetic changes, like the appearance of /f/ and /v/. Split ergativity: Hurrian is ergative, Hattic probably too. Increasing use of enclitic pronoun and particle chains after first stressed word: in Hattic after verb, in Hurrian after nominal forms. Almost obligatory use of clause initial and enclitic connectors: e.g. semantic and syntactic identity of Hattic pala/bala and Hittite nu. NOTE. For a superficial discussion of this, see e.g. An Indo-European Linguistic Area and its Characteristics: Ancient Anatolia. 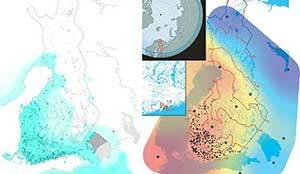 Areal Diffusion as a Challenge to the Comparative Method?, by Calvert Watkins. You can also search for any of the mentioned shared isoglosses between Middle Eastern languages and Anatolian if you want more details. The period of Proto-Anatolian linguistic unity can now be placed in the 4th millennium BCE and may have been contemporaneous with e.g. 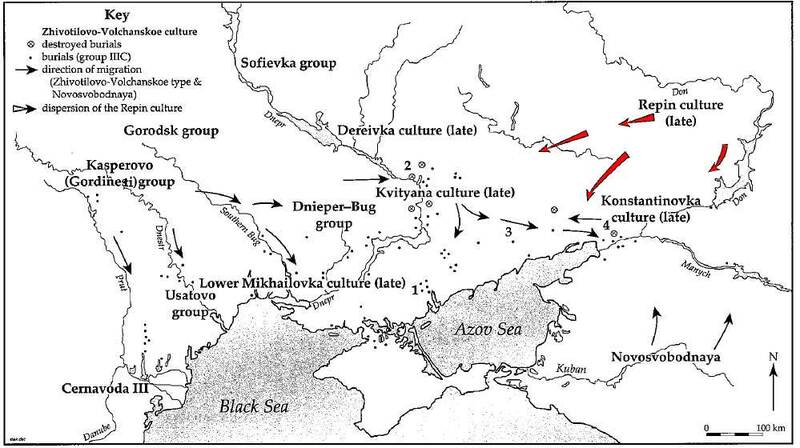 the Maykop culture (3700–3000 BCE), which influenced the formation and apparent westward migration of the Yamnaya and maintained commercial and cultural contact with the Anatolian highlands (Kristiansen et al. 2018). The EHG ancestry detected in individuals associated with both Yamnaya (3000–2400 BCE) and the Maykop culture (3700–3000 BCE) (in prep.) is absent from our Anatolian specimens, suggesting that neither archaeological horizon constitutes a suitable candidate for a “homeland” or “stepping stone” for the origin or spread of Anatolian Indo- European speakers to Anatolia. However, with the archaeological and genetic data presented here, we cannot reject a continuous small-scale influx of mixed groups from the direction of the Caucasus during the Chalcolithic period of the 4th millennium BCE. While it is difficult to speak about the consequences of this find without having access to this paper in preparation or its samples, we already knew that Maykop had obvious cultural contacts with the steppe. It will not be surprising to find not only EHG, but also R1b-L23 subclades there. In my opinion, though, the most likely source of EHG ancestry in Maykop (given the different culture shown in other steppe groups) is exogamy. The question will still remain: was this a Proto-Anatolian-speaking group? A break-up of Anatolian ca. 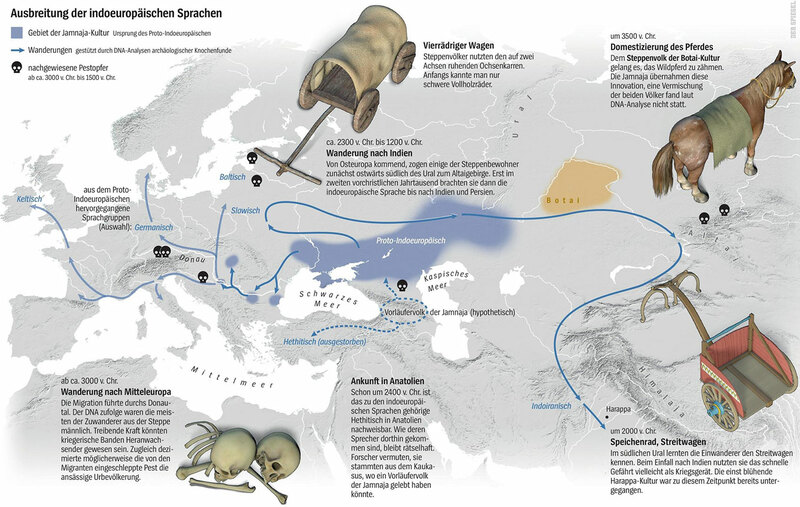 4500 BC represented by some early group migrating into the Northern Caucasus area. For this group – who were closely related linguistically and culturally to early Khvalynsk – to remain isolated in or around the Northern Caucasus, i.e. 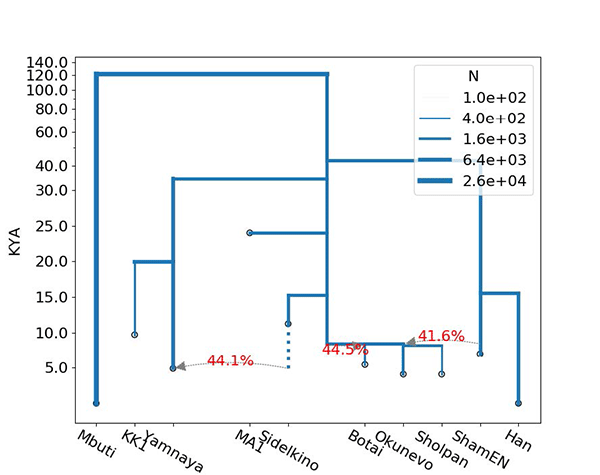 somehow ‘hidden’ from the evolving LPIE speakers in late Khvalynsk/early Yamna peoples. Then, they would need to have migrated from Maykop to Anatolian territory only after ca. 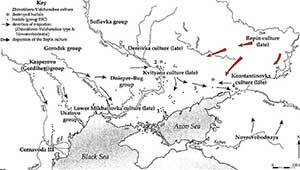 3700 BC – while having close commercial contacts with Khvalynsk and the North Pontic cultures in the period 3700-3000 BC -, in some migration wave that has not showed up in the archaeological records to date. Then appear as Old Hittites without showing EHG ancestry (even though they show it in the period 3700-3000 BC), near the region of the Armi state, where Anatolian was supposedly spoken already in the mid-3rd millennium. Not a very convincing picture, right now, but indeed possible. 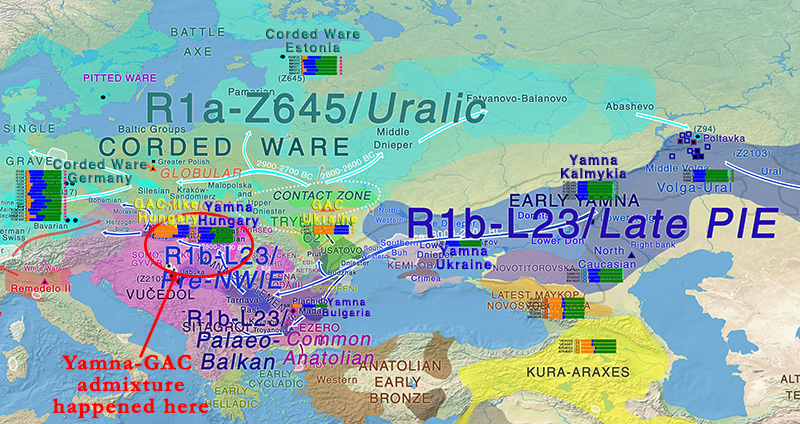 Also, we have R1b-Z2103 lineages and clear steppe ancestry in the region probably ca. 2500 BC with Hajji Firuz, which is most likely the product of the late Khvalynsk migration waves that we are seeing in the recent papers. These migrations are then related to early LPIE-speaking migrants spreading after ca. 3300 BC – that also caused the formation of early Yamna and the expansion of Tocharian-related migrants – , which leaves almost no space for an Anatolian expansion, unless one supports that the former drove the latter. NOTE. In any case, if the Caucasus route turned out to be the actual Anatolian route, I guess this would be a way as good as any other to finally kill their Indo-European – Corded Ware theory, for obvious reasons. In the paper it is clearly stated that there is no Neolithic Iranian ancestry in the Old Hittite samples. Ancestry is not people, and it is certainly not language. 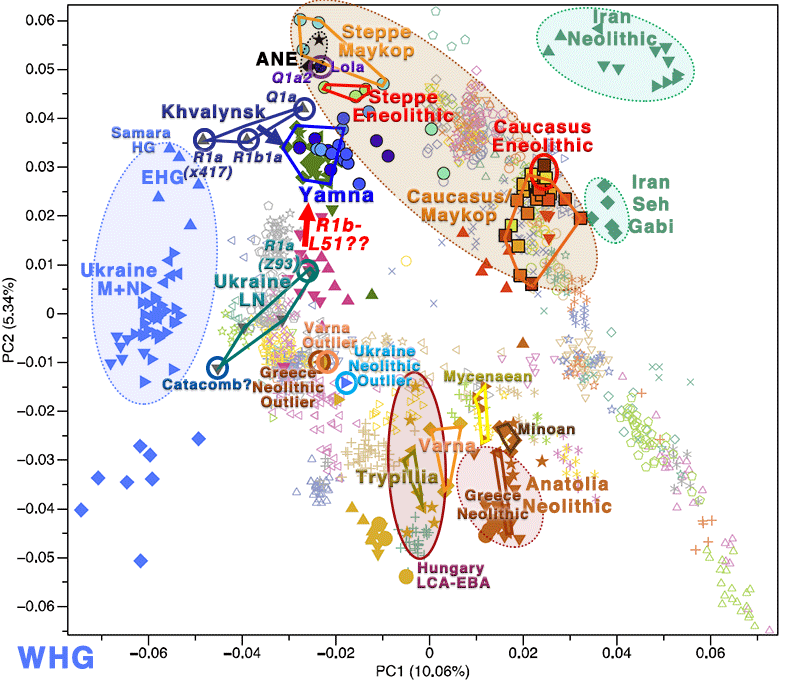 The addition of CHG ancestry to the Eneolithic steppe need not mean a population or linguistic replacement. Although it could have been. But this has to be demonstrated with solid anthropological models. NOTE. On the other hand, if you find people who considered (at least until de Barros Damgaard et al. 2018) steppe (ancestry/PCA) = Indo-European, then you should probably confront them about why CHG in Hittites and the arrival of CHG in steppe groups is now not to be considered the same, i.e why CHG / Iran_N ≠ PIE. Since there has been no serious North Iranian homeland proposal made for a while, it is difficult to delineate a modern sketch, and I won’t spend the time with that unless there is some real anthropological model and genetic proof of it. I guess the Armenian homeland hypothesis proposed by Gamkrelidze and Ivanov (1995) would do, but since it relies on outdated data (some of which appears also in Gimbutas’ writings), it would need a full revision. NOTE. Their theory of glottalic consonants (or ejectives) relied on the ‘archaism’ of Hittite, Germanic, and Armenian. As you can see (unless you live in the mid-20th century) this is not very reasonable, since Hittite is attested quite late and after heavy admixture with Middle Eastern peoples, and Germanic and Armenian are some of the latest attested (and more admixed, phonetically changed) languages. This would be a proper answer, indeed, for those who would accept this homeland due to the reconstruction of ‘ejectives’ for these languages. Evidently, there is no need to posit a homeland near Armenia to propose a glottalic theory. Kortlandt is a proponent of a late and small expansion of Late PIE from the steppe, and still proposes a reconstruction of ejectives for PIE. But, this was the main reason of Gamkrelidze and Ivanov to propose that homeland, and in that sense it is obviously flawed. 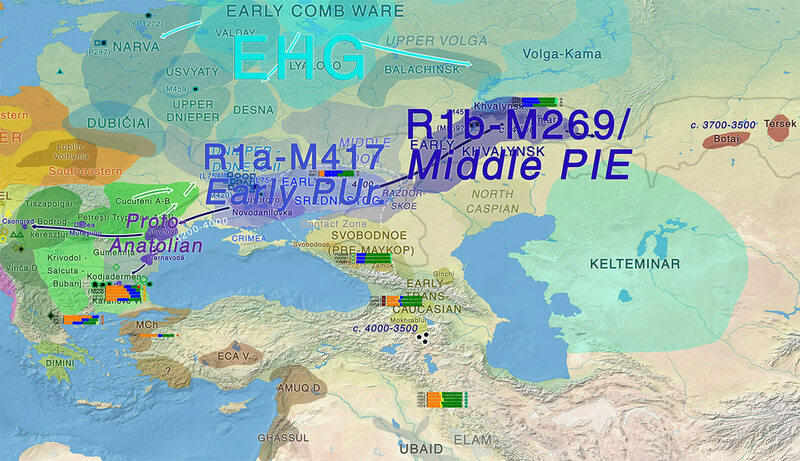 Those claiming a relationship of the North Iranian homeland with such EHG ancestry in Maykop, or with the hypothetic Proto-Euphratic or Gutian, are obviously not understanding the implications of finding steppe ancestry coupled with (likely) early Late PIE migrants in the region in the mid-4th millennium. Another, simultaneous paper with the Eurasian samples from Nature, The first horse herders and the impact of early Bronze Age steppe expansions into Asia, by de Barros Damgaard et al., Science (2018). A lot of interesting data, I will try to analyse its main implications, if only superficially, in sections. 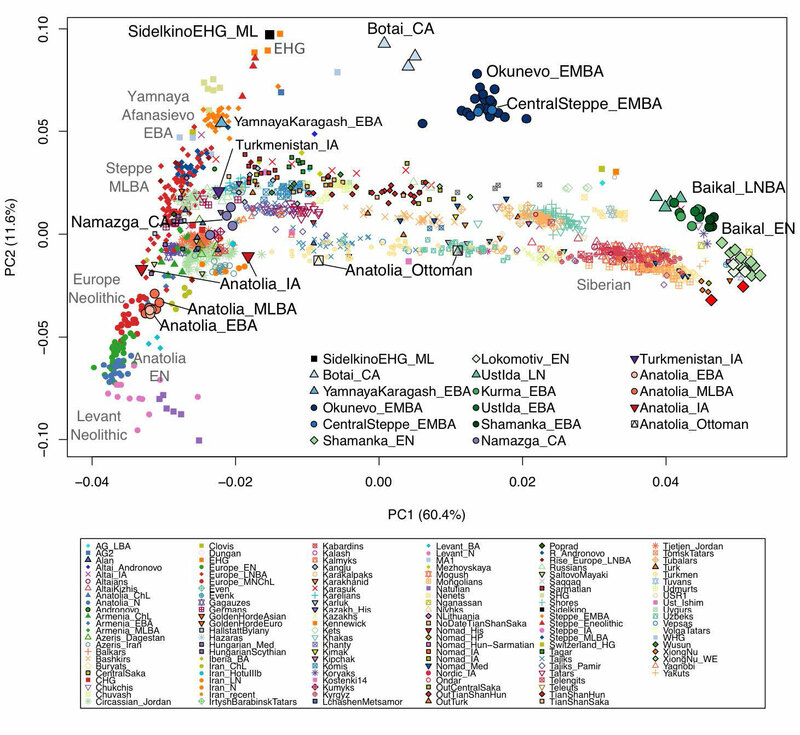 Anatolia_EBA from Ovaören, and Anatolia_MLBA (this including Assyrian and Old Hittite samples), all from Kalehöyük, show almost no change in Y-DNA lineages (three samples J2a, one G2a), and therefore an origin of these people in common with CHG and Iranian Neolithic populations is likely. No EHG ancestry is found. And PCA cluster is just somehow closer to Europe, but not to EHG populations. NOTE. Hittite is attested only in the late first half of the 2nd millennium, although the authors cite (in the linguistic supplement) potential evidence from the palatial archives of the ancient city of Ebla in Syria to argue that Indo-European languages may have been already spoken in the region in the late 3rd millennium BCE. Layer V of GT-137 was the richest in terms of architectural finds and dates to the Early Bronze Age II. In this layer, 2 different structures and a well were uncovered. The well was filled with stones, pottery, and human skeletons (Figs. S2 and S3). 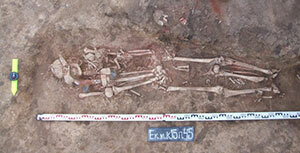 In total, skeletons belonging to 22 individuals, including adults, young adults, and children, must belong to the disturbed Early Bronze Age II graves adjacent to the well (103). Pottery and stones found below the skeletons demonstrate that the water well was consciously filled and closed. The fill consists of dumped stones, sherds and skeletons, and the closing stones demonstrate that the water well was consciously filled and cancelled. The Middle Bronze Age at Kaman-Kalehöyük represented by stratum IIIc yields material remains (seals and ceramics) contemporary with the international trade system managed by expatriate Assyrian merchants evidenced at the nearby site of Kültepe/Kanesh. It is therefore also referred to as belonging to the “Assyrian Colony Period” (98). The stratum has revealed three burned architectural units, and it has been suggested that the seemingly site-wide conflagration might be connected to a destruction event linked with the emergence of the Old Hittite state (99). (…) Omura (100) suggests that the rooms could belong to a public building, and that it might even be a small trade center based on the types of artifacts recovered. 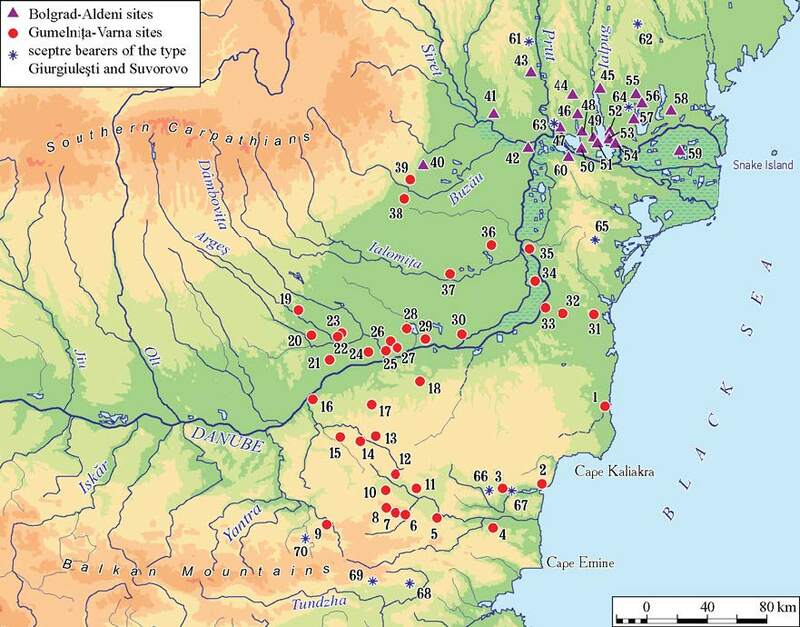 Omura (100) has concluded that the evidence from the first complex indicates a battle between 2 groups took place at the site. It is possible that a group died inside the buildings, mostly perishing in the fire, while another group died in the courtyard. NOTE. For more on the Old Hittite period, you can read this for example. 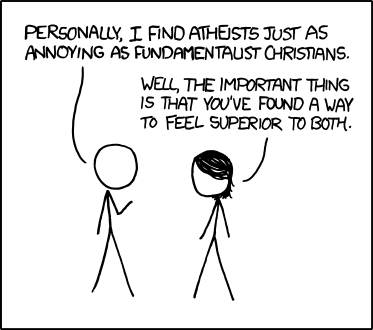 The PCA (Fig. 2B) indicates that all the Anatolian genome sequences from the Early Bronze Age ( -2200 BCE) and Late Bronze Age (-1600 BCE) cluster with a previously sequenced Copper Age ( -3900- 3700 BCE) individual from Northwestern Anatolia and lie between Anatolian Neolithic (Anatolia_ N) samples and CHG samples but not between Anatolia_N and EHG samples. (…) we are not able to reject a two-population qpAdm model in which these groups derive -60% of their ancestry from Anatolian farmers and -40% from CHG-related ancestry (p-value = 0.5). This signal is not driven by Neolithic Iranian ancestry. 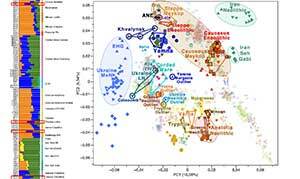 Principal Component Analysis estimated with ancient and modern Eurasians. NOTE. Anatolian Iron Age samples, from the Hellenistic period, which was obviously greatly influenced by different, later Indo-European migrations, does show a change in PCA. 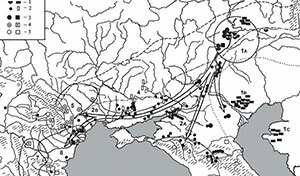 Ancient DNA findings suggest extensive population contact between the Caucasus and the steppe during the Copper Age (-5000-3000 BCE) (1, 2, 42). 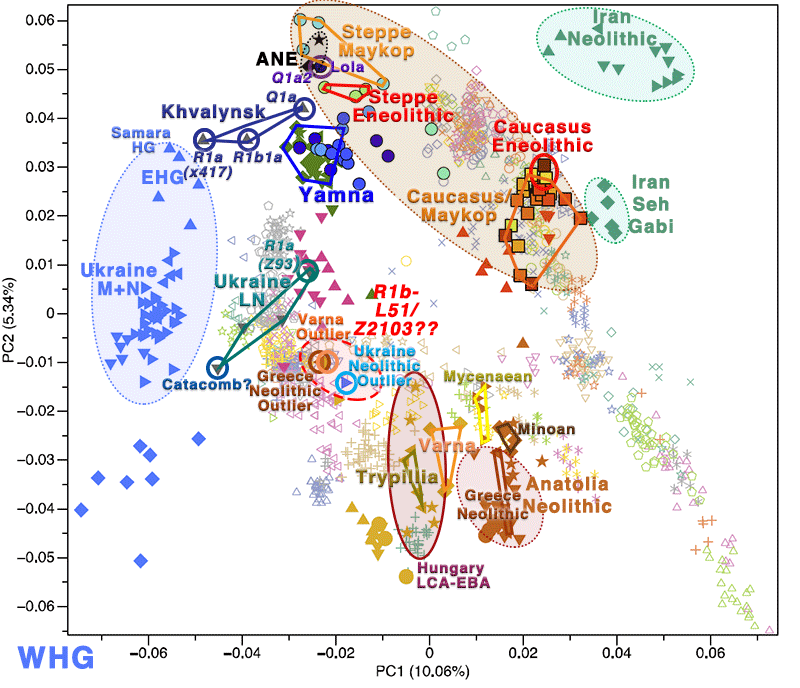 Particularly, the first identified presence of Caucasian genomic ancestry in steppe populations is through the Khvalynsk burials (2, 47) and that of steppe ancestry in the Caucasus is through Armenian Copper Age individuals (42). These admixture processes likely gave rise to the ancestry that later became typical of the Yamnaya pastoralists (7), whose IE language may have evolved under the influence of a Caucasian language, possibly ‘from the Maykop culture (50, 55). This scenario is consistent with both the “Copper Age steppe” (4) and the “Caucasian” models for the origin of the Proto-Anatolian language (56). 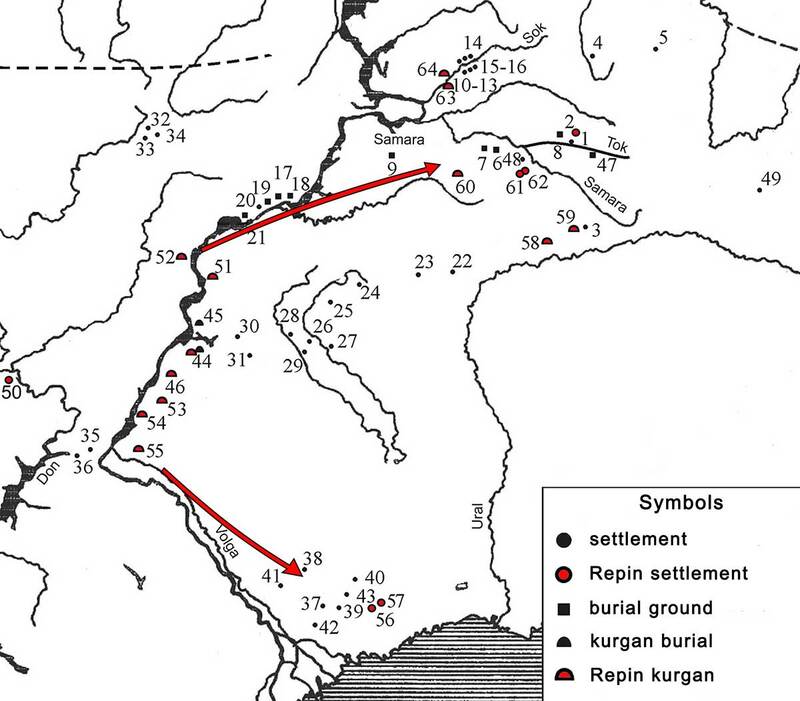 The CHG specific ancestry and the absence of EHG-related ancestry in Bronze Age Anatolia would be in accordance with intense cultural interactions between populations in the Caucasus and Anatolia observed during the late 5th millennium BCE that seem to come to an end in the first half of the 4th millennium BCE with the village-based egalitarian Kura-Araxes society (59, 60), thus preceding the emergence and dispersal of Proto-Anatolian. Our results indicate that the early spread of IE languages into Anatolia was not associated with any large-scale steppe-related migration, as previously suggested (61). 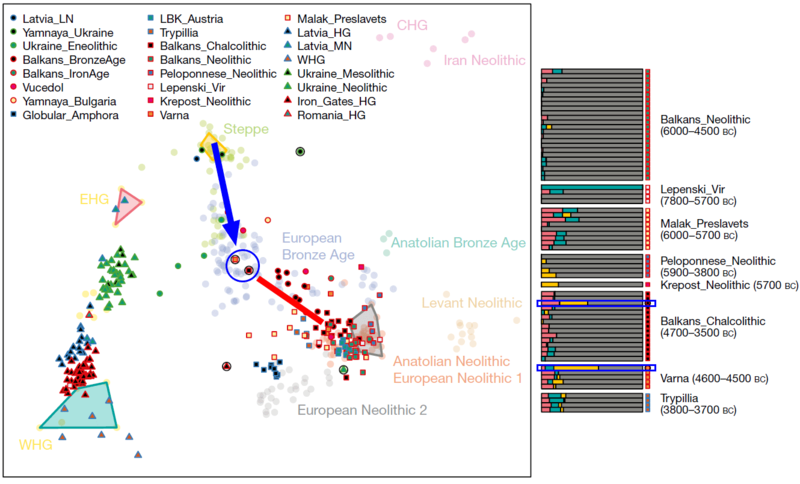 Additionally, and in agreement with the later historical record of the region (62), we find no correlation between genetic ancestry and exclusive ethnic or political identities among the populations of Bronze Age Central Anatolia, as has previously been hypothesized ( 63). There is no steppe ancestry or R1b-M269 lineages near early historic Hittites. Yet. Indo-Iranian developed in East Yamna/Poltavka, which turned into a Sintashta/Srubna/Andronovo community after receiving Corded Ware migrants with their ancestry and lineages (R1a-Z645 subclades) from Abashevo. Their language did not change, though, beyond the (mainly phonetic) Uralic substrate acquired from the incomers. N1c lineages and Siberian ancestry arrived late in North-East Europe, modifying the ancestry of North-East European groups – with each region showing its own different late waves of N lineages or Siberian ancestry. Even after the known bottlenecks and the subsequent expansion of recently arrived haplogroups and ancestry, there was not much cultural (or ethnolinguistic) impact. That neither steppe ancestry nor R1b-M269 subclades, already diminished in Bulgaria in the mid-5th millennium, did reach Anatolia, but only those Common Anatolian-speaking Aegean groups over whose ancestors Proto-Anatolians (marked by incoming EHG ancestry) would have previously dominated in the Balkans. That steppe ancestry and R1b-M269 subclades did in fact arrive in the Aegean, but EHG was further diluted among the CHG-related population by the time of the historic Anatolian-speaking peoples in central Anatolia. Or, the most likely option, that their trace have not been yet found. Probably the western Luwian peoples, near Troy, were genetically closer to Common Anatolians. Both of these scenarios are interesting, in that they show potential links between Pre-Greek peoples of Hellas (related to Anatolians) and the Pelasgian substrate of early Greek dialects, since they show a similar recent CHG-related wave from the East. What we can assert right now is that Proto-Anatolian must have separated quite early for this kind of data to show up. This should mean an end to the Late PIE origin of Anatolian, if there was some lost soul from the mid-20th century still rooting for this. As I said in my review of Lazaridis’ latest preprint, we will have to wait for the appropriate potential routes of expansion of Proto-Anatolian to be investigated. As he answered, the lack of EHG poses a problem for steppe expansion into Anatolia, but there is still no better alternative model proposed. 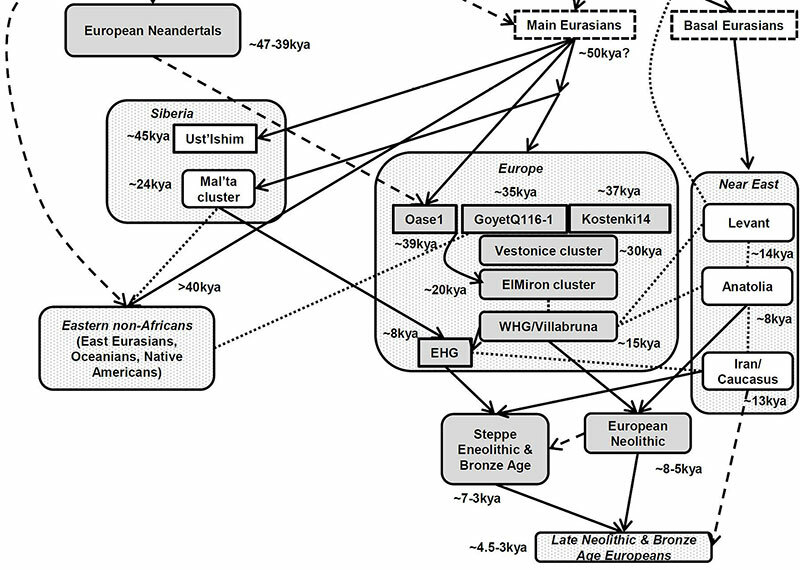 Model-based clustering analysis of present-day and ancient individuals assuming K = 6 ancestral components. 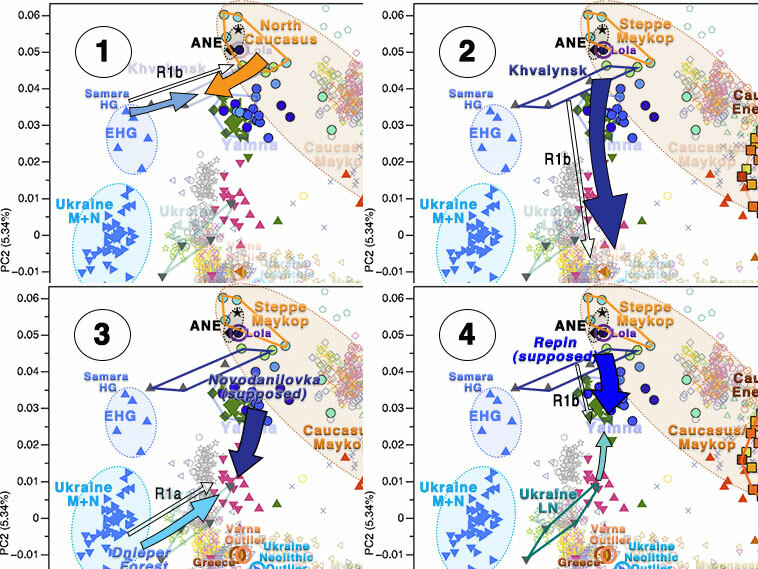 The main ancestry components at K = 6 correlate well with CHG (turquoise), a major component of Iran_N, Namazga_CA and South Asian dines; EHG (pale blue), a component of the steppe dine and present in South Asia; East Asia (yellow ochre), the other component of the steppe d ine also in Tibeto-Burman South Asian populations; South Indian (pink), a core component of South Asian populations; Anatolian_N (purple), an important component of Anatolian Bronze Age and Steppe_MLBA; Onge (dark pink) forms its own component. Our findings are thus consistent with historical models of cultural hybridity and “Middle Ground” in a multi-cultural and multi-lingual but genetically homogeneous Bronze Age Anatolia (68, 69). Current linguistic estimations converge on dating the Proto-Anatolian split from residual PIE to the late 5th or early 4th millennia BCE (58, 70) and place the breakup of Anatolian IE inside Turkey prior to the mid-3rd millennium (53, 71,72). We cannot at this point reject a scenario in which the introduction of the Anatolian IE languages into Anatolia was coupled with the CHG-derived admixture prior to 3700 BCE, but note that this is contrary to the standard view that PIE arose in the steppe north of the Caucasus (4) and that CHG ancestry is also associated with several non-IE-speaking groups, historical and current. Indeed, our data are also consistent with the first speakers of Anatolian IE coming to the region by way of commercial contacts and small-scale movement during the Bronze Age. Among comparative linguists, a Balkan route for the introduction of Anatolian IE is generally considered more likely than a passage through the Caucasus, due, for example, to greater Anatolian IE presence and language diversity in the west (73). Further discussion of these options is given in the archaeological and linguistic supplementary discussions (48, 49). First, they realized how stupid it is to identify ancestral component with peoples, and especially with language. We have already seen this come into question recently by David Reich and Iosif Lazaridis, regarding East Bell Beakers and especially Iberian Bell Beakers, with Y-DNA becoming again essential to assess migrations when ancestry changes within few generations due to male-driven migration. Second, funnily enough, if they accepted in this case their previous approach to ancestral components (and thus a Southern Caucasus origin of Middle PIE and R1b-M269), then early Late PIE must have necessarily begun at the end of the 5th millennium in Khvalynsk (with R1b-L23 subclades, as we already know it happened), ergo the Indo-European – Corded Ware theory (or, rather, their current Germanic-CWC association, since Balto-Slavic and Indo-Iranian seem not to be important anymore) would not just be as untenable as it is today, it would be outright absurd. The possibility of having an early PIE around the Caucasus, potentially closely related not only to Uralic to the north, but also to Caucasian languages, Sumerian, Afroasiatic, Elamo-Dravidian, etc. could be a good reason for those excited with these few samples to begin dealing with macro-language proposals, such as Eurasiatic and Nostratic. If demonstrated to be true, a Northern Iranian origin of Middle PIE would also help relieve a little bit the pressure that some are feeling about the potentially male-driven Indo-European continuity (even if not “autochthonous”) associated with the expansion of R1b-L23 subclades. On the other hand, I am a firm supporter of solid anthropological models of migration, and of “late and small” language expansions, usually accompanied by demic diffusion, which has been demonstrated to be linked with haplogroup expansion and reduction in variability. Therefore, for the moment, even if it is weak – as weak as it always was (but still stronger than Gimbutas’ Maykop route) – the Balkan route seems like the best fit for all the data combined. 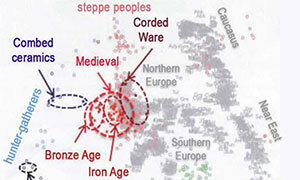 In fact, we already have steppe ancestry moving into the Lower Danube and Bulgaria in the mid-5th millennium. Let’s not forget that. Interesting data from an early East Yamna offshoot at Karagash, ca. 3018-2887 BC, of R1b-Z2106 lineage, which shows some ancestry, lineage, and cultural continuity in Sholpan, ca. 2620-2468 BC, in Kazakhstan. This sample might be part of another descendant group from the migration waves that reached Afanasevo, and can thus be related to other early Asian R1b-L23 samples found in Narasimhan et al. (2018). An admixture event, where Yamnaya is formed from a CHG population related to KK1 [=Kotias, dated ca. 7800 BC] and an ANE population related to Sidelkino and Botai. We inferred 54% of the Yamnaya ancestry to come from CHG and the remaining 46% to come from ANE. A split event, where the CHG component of Yamnaya splits from KK1. The model inferred this time at 27 kya (though we note the larger models in Sections S2.12.4 and S2.12.5 inferred a more recent split time [see below graphic]). A 10-leaf model based on combining the models in Fig. S16 and Fig. S19 and re-estimating the model parameters. The lack of evidence of admixture between Botai horse herders and western steppe pastoralists is consistent with these latter migrating through the central steppe but not settling until they reached the Altai to the east (4). More significantly, this lack of admixture suggests that horses were domesticated by hunter-gatherers not previously familiar with farming, as were the cases for dogs (38) and reindeer (39). Domestication of the horse thus may best parallel that of the reindeer, a food animal that can be milked and ridden, which has been proposed to be domesticated by hunters via the “prey path” (40); indeed anthropologists note similarities in cosmological beliefs between hunters and reindeer herders (41). 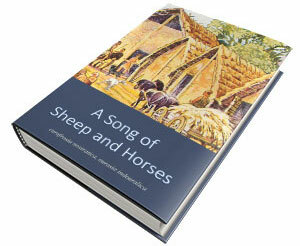 In contrast, most animal domestications were achieved by settled agriculturalists (5). NOTE. I am not sure, but they seem to hint that there were separate events of horse domestication and horse-riding technique by the Botai and Yamna populations due to their lack of genetic contribution from the latter to the former. I guess they did not take into account farming spreading to the steppe without genetic contribution beyond the Dnieper… In fact, the superiority in horse-riding shown by the expanding Yamna peoples – as they state – should also serve to suggest from where the original technique expanded. However, direct influence of Yamnaya or related cultures of that period is not visible in the archaeological record, except perhaps for a single burial mound in Sarazm in present-day Tajikistan of contested age (44, 45). Additionally, linguistic reconstruction of proto-culture coupled with the archaeological chronology evidences a Late (-2300-1200 BCE) rather than Early Bronze Age (-3000-2500 BCE) arrival of the Indo-Iranian languages into South Asia (16, 45, 46). 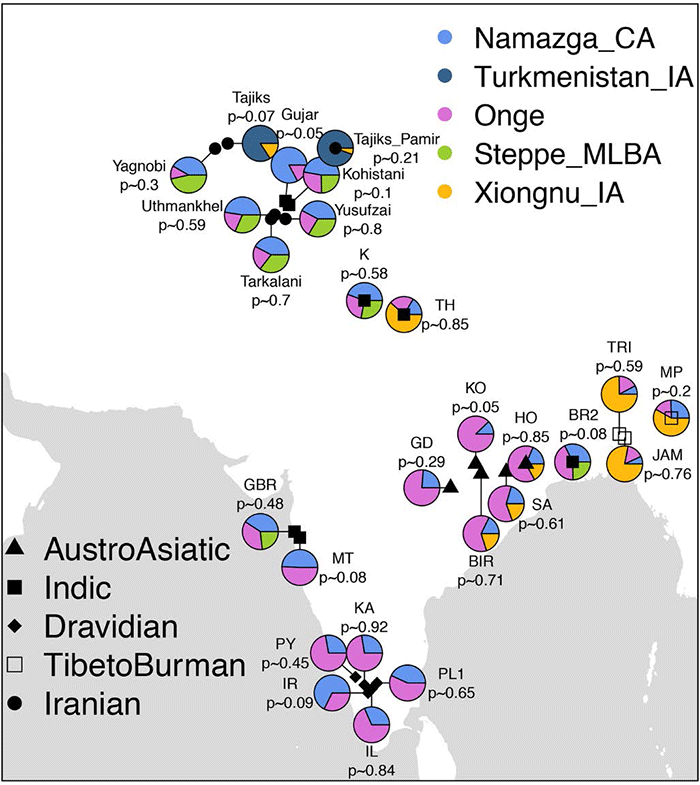 Thus, debate persists as to how and when Western Eurasian genetic signatures and IE languages reached South Asia. Samples from the Namazga region (current Turkmenistan) from the Iron Age show an obvious influence from steppe MLBA (ca. 2300-1200 BC), and not steppe EBA (i.e. Yamna), population, in contrast with samples from the Chalcolithic (ca. 3300 BC), which don’t show this influence. This helps distinguish prior contacts with Iran Neolithic from the actual steppe population that expanded Indo-Iranian into Asia. Very interesting therefore the Namazga CA sample (ca. 855 BC), of R1a-Z93 subclade, showing the sign of immigrant Indo-Aryans in the region. For more on this we will need an evaluation in common with the corrected data from Narasimhan et al. (2018), and all, including de Barros (Nature 2018), in combination with statistical methods to ascertain differences between early Indo-Aryans and Iranians. A summary of the four qpAdm models fitted for South Asian populations. For each modern South Asian population. we fit different models with qpAdm to explain their ancestry composition using ancient groups and present the f irst model that we could not reject in the following priority order: 1. Namazga_CA + Onge, 2. 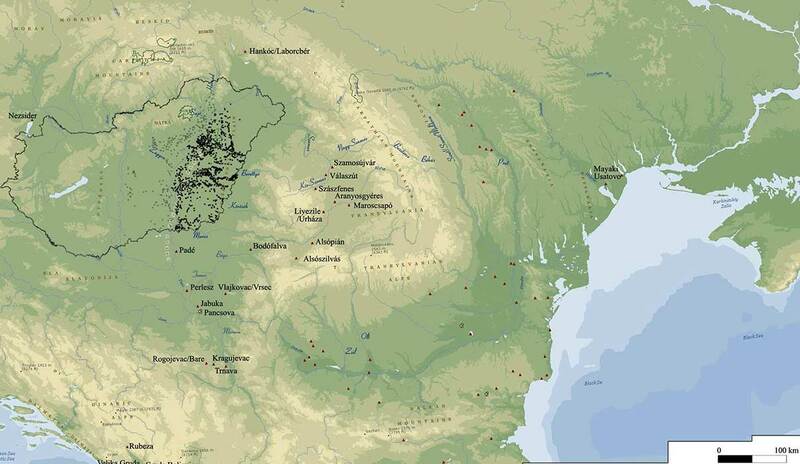 Namazga_CA + Onge + Late Bronze Age Steppe, 3. Namazga_CA + Onge + Xiongnu_lA (East Asian proxy). and 4. Turkmenistan_lA + Xiongnu_lA. Xiongnu_lA were used here to represent East Asian ancestry. We observe that while South Asian Dravidian speakers can be modeled as a mixture of Onge and Namazga_CA. 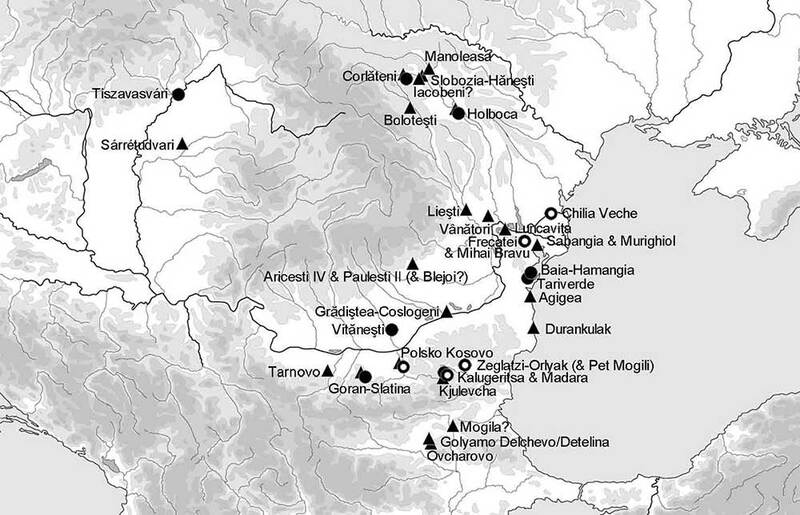 an additional source related to Late Bronze Age steppe groups is required for IE speakers. In Tibeto-Burman and Austro-Asiatic speakers. an East Asian rather than a Steppe_MLBA source is required. NOTE. Also interesting to see no R1a in Baikal hunter-gatherers after ca. 3500 BC, and a prevalence of N lineages as supported in a previous paper on the Kitoi culture, which some had questioned in the past. 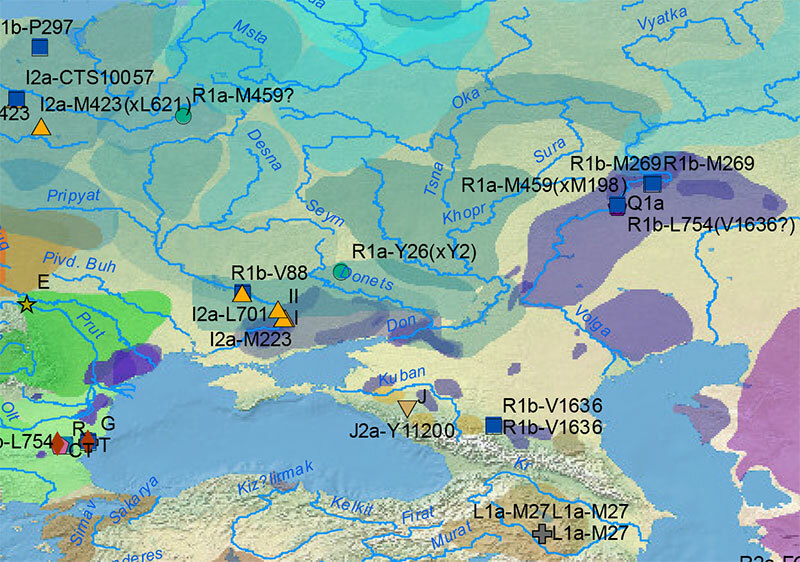 In fact, the only N1c1 sample comes from Ust’Ida Late Neolithic, 180km to the north of Lake Baikal, apparently before the expansion of Q1a2a lineages during the EBA period. While this sample may be related to those expanded later in Finno-Ugric territory (although it may only be related to those expanded much later with Yakuts), other samples are not clearly from those found widely distributed among North-East Europeans only after the Iron Age, or – as in the case of Shamanka II (N1c2), they are clearly not of the same haplogroup. It is great to see the paper and the supplementary material deal with Y-DNA haplogroups and their relevance for migrations with such detail. Especially because this paper comes from the same Copenhagen-based research group that originally associated ancestry with language, creating thus today’s mess based on steppe ancestry. Regarding Y-DNA data, once again almost 100% of samples from late Khvalynsk/Yamna and derived cultures (like Afanasevo and Bell Beaker) are R1b-L23, no single R1a-M417 lineage found, and few expected by now, if any, within Late Proto-Indo-European territory. While they claim to take Y-DNA into account to assess migrations – as they do for example with Asian cultures – , their previous model of a Yamna “R1a-R1b community” remains oddly unchanged, and they even insist on it in the supplementary materials, as they do in their parallel Nature paper. They have also expressly mitigated the use of ancestral components to assess populations, citing the ancestral and modern association of CHG ancestry with different ethnolinguistic groups in the Middle East, to dismiss any rushed conclusions on the origin of Anatolian, and consequently of Middle PIE. And they did so evidently because it did not fit the anthropological data that is mainstream today (supporting a Balkan route), which is the right thing to do. However, they have apparently not stopped to reconsider the links of CWC and steppe ancestry to ancestral and modern Uralic peoples – although they expressly mention the strong connection with modern Karelians in the supplementary material. Also, after Narasimhan et al. (2018), there is a clear genetic continuity with East Yamna (in ancestry as in R1b-L23 subclades), so their interpretations about Indo-Iranian in this paper and especially de Barros (Nature 2018) – regarding the Abashevo -> Sintashta/Srunba/Andronovo connection – come, again, too late.